Through the provision of quality, adapted seeds, greenhouses and training in good agricultural practices, farmers in Kenya are diversifying their production with the introduction of herbs. In Kenya, more than 2,000 smallholder farmers are accessing international markets and increasing their incomes through herb farming. In order to meet growing global demand, seed and vegetable company, Premier Seed, has been working with the farmers to provide them with training in herb production and in how to meet international food safety and quality standards. The company aimed to encourage farmers to move away from traditional cultivation of cereals and pulses, which continue to produce low yields as a result of incessant pest and disease attacks and poor farmgate prices. Herbs like basil and chives are perennial and mature after 45 days – unlike maize or beans which take a minimum of 3 months to mature – and can be harvested every 10 days, providing a frequent and reliable income. “We wanted to convince farmers of the benefits and transform their farming experiences,” says Eunice Wanjohi, Premier Seed’s lead agronomist. The project was first piloted in 2012 with 50 farmers from Nakuru in Rift Valley who were trained in the production of basil and chives. The project has now reached 2,000 farmers across key agricultural areas in Kenya and introduced a variety of other herbs, including oregano, thyme, rosemary and tarragon. To ensure optimum yields are achieved, Premier Seed works with seed breeders from the Netherlands who produce varieties well adapted to the dry climate and alkaline soil conditions. “Seed is the foundation of every farming venture so we have to make sure we get it right from the start,” says Simon Andys, CEO and founder of Premier Seed. James Kuria who had been farming maize, beans and peas for 40 years is one of the project’s pioneering farmers and now runs four greenhouses in which he grows basil, dill and thyme. “I used to earn on average Ksh 23,503 [€200] per month before delving into herbs and I struggled to take care of my family. Now, from my herb farming alone, I earn Ksh 47,000 [€400] every month. My wife left her shop business to help me because the results from the farm are so impressive. We have introduced over 20 other farmers to this venture,” he says. In addition to quality seeds, farmers are provided with training in good agricultural practices, such as the judicious use of chemicals and water, pest management and produce traceability – which they can enhance by allowing their location and planting and harvesting details to be accessed online. 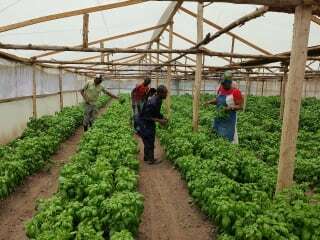 Premier Seed also constructs greenhouses for farmers who are able to afford the costs as a result of partnerships established between the company and financial institutions. The banks extend credit facilities to the farmers and once they start earning from their exports, a pre-agreed upon proportion of their income is deducted to repay the loan amount. Premier Seed initially targeted the European market, but has since identified new markets in the Middle East and US. The company is recruiting more farmers to meet the burgeoning demand and is currently training another 2,500 farmers, with the aim of reaching a further 7,000 by 2020. By providing financial and technical support to dairy farmers in Kenya, a local agribusiness is diversifying its product line whilst enabling farmers to expand their operations. Farmers in Kenya are supplying a local agri-processing company with millet, groundnuts and honey to produce nutritious snacks and strengthen local value chains.